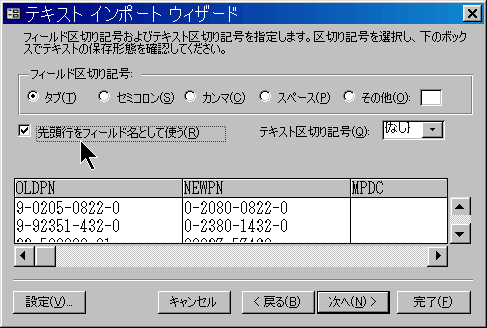 & Format(終了日時 - 開始日時, "hh時間nn分ss秒") & " でした。"
'   DoCmd.TransferText acImportFixed, "定義名", "データを格納するテーブル名", "C:\..テキストのパス....txt", False, ""
DoCmd.TransferText acImportDelim, "品番PDCインポート定義", "品番PDCデータ", インポートするファイルのパス, False, ""
削除クエリ = "DELETE * FROM [品番PDCデータ];"
DoCmd.OpenForm "社員", , ,"[在籍支社] = '大阪支社'"
" WHERE 社員.在籍支社 = '北九州支社';"
' Open database in Microsoft Access.
" verified within Northwind database." " does not exist within Northwind database." 'Your command name, any parameters, and an optional Recordset. 'Your stored procedure name and any parameters. & "品番データ.海外ランク = [SBTW], 品番データ.統合ランク = [SBTA];"
& "DATABASE=pubs", acTable, "Authors", "dboAuthors"
DoCmd.TransferDatabase acLink, "dBase IV", "C:\DataDir", acTable, "TheDBF", "TheTable"
削除クエリ = "DELETE * FROM [用品品番];"
DoCmd.TransferDatabase acLink, "dBase 5.0", インポートするファイルのフォルダ, acTable, リンク元ファイル名, "BMF今月"
"Data from linked table connected to first source:"
"Data from linked table connected to second source:"
If Not .EOF Then Debug.Print , "[more records]"
前年月 = CStr(Val(Left(年月, 4) - 1)) & "12"
& "FROM [エラーリスト(" & 年月 & ")];"
DoCmd.TransferText acImportFixed, "エラーリストのインポート定義", テーブル名, インポートするファイルのパス, False, ""
DoCmd.Rename "エラーリスト(" & 前年月 & ")品番キー", acTable, "エラーリスト品番キー"